It’s not just a headline, dental implants really are the #1 recommended tooth replacement solution – by doctors and patients alike. Why? Think of your teeth like flowers. You wouldn’t just place a flower on top of the soil and expect it to flourish. The health of the flower is in the roots – just as healthy teeth require healthy tooth roots. Dental implants replace teeth from root to crown for the most comprehensive restoration available. What’s the best part? Dr. Michael Grier at Grinview Smiles is one of the few general dentists in Grandview that can place implants in house – no need to find a specialist! 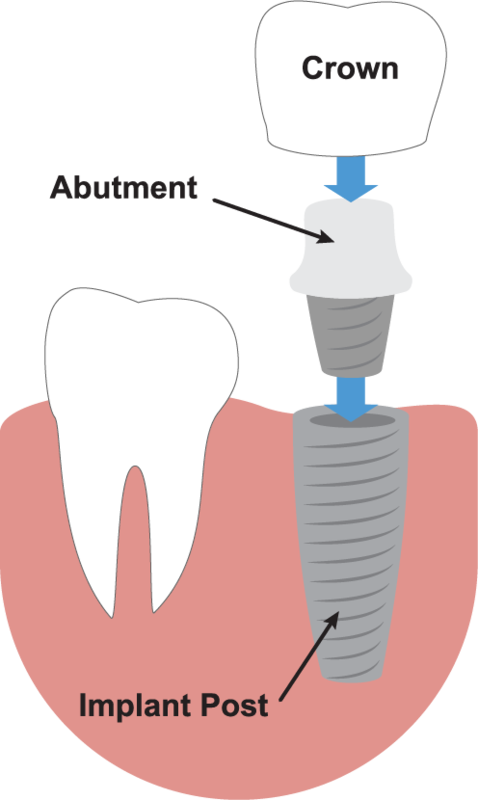 Dental implants are small titanium posts that are surgically inserted into the gums and allowed to fuse with the jawbone. Rather than just replacing the crown, dental implants actually replace the root of the tooth, which is essential in maintaining stability, as well as the health of surrounding teeth, bite, and jawbone health. Dental implants not only preserve your oral and jawbone health, but actually stimulate new bone and tissue growth. Implants serve as anchors for beautiful, secure, and natural looking restorations like crowns for a single tooth, bridges for several teeth, or dentures for a full mouth reconstruction. If you’ve suffered from jawbone deterioration caused by missing teeth, and have been told by other dentists that you are not a candidate for dental implants, we may have a solution for you with mini implants! Mini implants (as the name implies) are smaller than traditional implants, therefor require less jawbone density to be placed and successful. With the revolutionary All-on-4, Teeth in a Day system, we have the power to take our patients from missing teeth, to dental implants, to a beautiful full arch in a single appointment! What used to require multiple appointments, several months of healing time and temporary restorations can now be completed in just one visit with Dr. Michael Grier. We recommend All-on-4 to patients who are missing most or all of their natural teeth, who still have a healthy enough jawbone to support implants. The All-on-4 system uses the minimum number of implants (4) to support the maximum number of teeth (a full arch). This is the best way to preserve your oral and jawbone health, and the most secure way to replace missing teeth permanently. If you’re ready for the most advanced tooth replacement solution on the market, you’ve come to the right place! No need to find a specialist, Dr. Grier can take care of you every step of the way. If you have any questions about implants or would like to schedule a consultation with your Grandview implant dentist – Dr. Michael Grier at Grinview Smiles – give us a call today at (817) 866-2065.